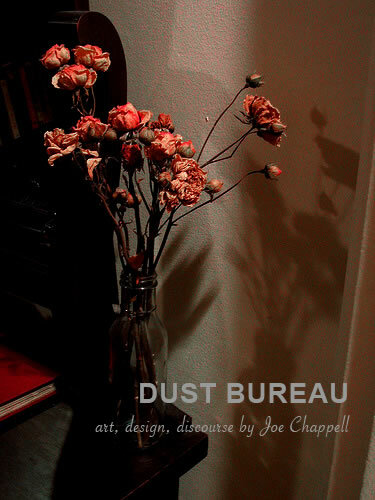 Welcome to DUST BUREAU: art, design, discourse wrapped up in an interesting collection of pages, papers and informative articles for your enjoyment! DUST BUREAU is both a real and an imagined realm, conducive to the formality of a high office of internal affairs, and the folk of an antique highboy with wobbly legs and creaky drawers. It is pinstriped grey flannel suits and hammers, cobwebbed chandeliers undoing themselves and crashing down on masquerade balls. It is the spiders that manifest in the memories of an afternoon daydream. It is the pageantry of good impressions and the echoing laughs of dreams that becloud the waking life. There is something special about the way in which different people view life and the things that are important or not, as the case may be. That multitude of ideas coalesces into what certain advisors sometimes like to create in those often heart warming, poignant quotes that seem to appear at every turn. Let's not miss out on that particular steam boat ride by adding a great one that stands out as being relevant to this project in particular. Dust is the cloak that shrouds many an entity of beauty - those exotic curiosities lurking in the shadows, ancient heirlooms passed down from dreamer to dreamer, the spirits of old ideas reborn for new times. "I always say that you cannot tell what a picture really is or what an object really is until you dust it every day..."